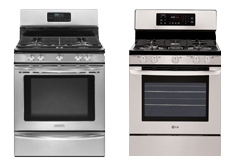 A range is two appliances in one – cooktop that sit on top of the unit and an integrated oven down below. Check the ranges consumers most liked. 1. LG LDG3016ST 30 inch Freestanding Convection Double Oven Gas Range with 6.1 cu ft Total Capacity, 5 Cooktop Elements, Delay Bake, IntuiTouch Controls and Variable Self-clean Cycle. 2. Maytag MET8885XS Gemini Series 30 inch Freestanding Electric Double-Oven Range with 5 Radiant Elements, 4.2 cu. ft. EvenAir True Convection Lower Oven, 2.5 cu. ft. Upper Oven and Triple Choice Element. 3. Samsung FX710BGS 5.8 cu. ft. Capacity Gas Range With True Convection, Commercial Look Grate, Warming Drawer, Split Racking System, Weighted Knob. 4. KitchenAid Architect Series II KDRS505XSS 6.7 cu. ft. 30 inch Freestanding Double Oven Range with True Convection System, Time and Temperature Conversion System and Roll-out Rack.